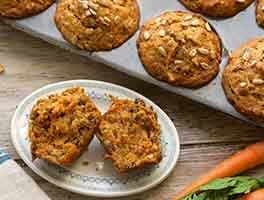 These easy muffins go together in a flash. 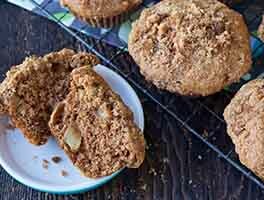 They're not overly sweet, so the crunchy sugar topping is a nice counterpoint to the muffin itself. Preheat the oven to 400°F. 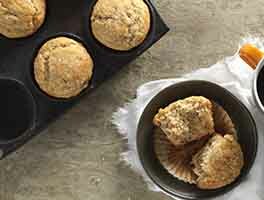 Lightly grease a 12-cup muffin pan, or line it with papers and grease the papers. To make the muffins: In a medium-sized mixing bowl, whisk together the flour, sugar, baking powder, and salt, then toss the cranberries into the mixture, stirring to coat. In a separate bowl, or in a large measuring cup, whisk together the egg, oil, milk, orange juice, and orange oil or peel. Gently and thoroughly mix the wet ingredients into the dry ingredients. 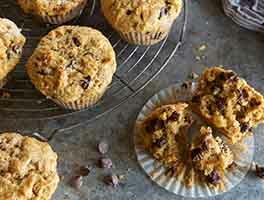 Using a muffin or cookie scoop, or a 1/4-cup measure, fill each muffin cup about 3/4 full. To make the topping: Combine all of the topping ingredients. Sprinkle a scant 1 tablespoon of topping over the batter in each muffin cup. Bake the muffins for 20 minutes, or until they're nicely domed and a cake tester inserted into the center of one comes out clean. Remove the muffins from the oven, and run a knife around the edge of each one to separate it from the pan. Carefully tilt each muffin in its cup so steam doesn't collect underneath as they cool. After about 5 minutes, transfer them to a rack to cool completely. 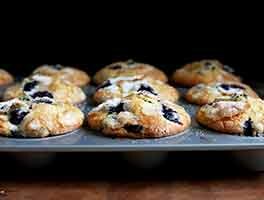 Store muffins for up to 3 days in a plastic bag on the counter; or freeze, well wrapped, for up to a month. 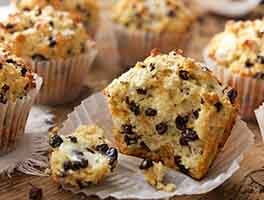 For a slightly tangier muffin, use coarsely chopped fresh or frozen cranberries in place of dried. After reading the recommendation in the review I did it with all the dry ingredients by weight and they came out perfectly after 20 minutes. I baked them in a silicone muffin pan that I lightly greased with butter and each one came out easily from the pan after letting it sit on a rack for 5 minutes. Did not need to fuss with running a knife around them or tilting the pan. I must say this is my go to recipe for muffins. Have made it many different ways and it has never failed me. I put a LOT more dried fruit in than called for. Often don't have milk or OJ but usually have yogurt. Throw some yogurt in a bowl and dilute it with water til I have the required cup of liquid. Any flavor extract that goes with the fruit. Maybe throw in some maple syrup or honey. Always has turned out great but not at all like grocery store/donut shop muffins. These do not resemble cupcakes. The topping really ties everything together and doesn't seem all that heavy with cinnamon. Making some right now! While the flavor of dried cranberries and fresh orange juice and zest is wonderful, the muffins were very dry. Thanks for baking this recipe, Derek! We're glad you enjoyed the flavor and would love to help remedy the dryness. The most common reason a recipe turns out dry is if any extra flour was packed (which flour likes to do!) into the measuring cup. For ideal measurement accuracy when not using a scale, we recommend fluffing the flour with a whisk or spoon, sprinkling it into the measuring cup, and scraping off the excess. Using this method or measuring by weight should result in a much more moist and tender muffin. I would like to use frozen cranberries in the muffins. Should I chop them well? Would I need to change any of the oil and egg amounts? I love love anything cranberry,that's why I have four bags in my freezer. Hope you can help. I was craving muffins & usually get mine from McDonald's. These turned out so good & will be my go-to from now on! I made a small change & used 2 tbsp soy flour before measuring 1 cup of flour. Turned out light & delish. Wish I could add the pic I took as it's picture perfect! I bake muffins on a weekly basis and found these to be dry and lacking in flavor. I add organic orange extract and use butter rather than oil when I normally make this. But figured I would try a different recipe. Going to stick with what works. Wonderful recipe. I didn't (and wouldn't) change a thing. I also used dried cranberries (roughly chopped) and had no problem adding them to the batter as is. Super moist muffins. I added almond extract and slivered almonds to the batter and used oatmeal instead of pecans for the topping. They were delicious. I just baked these muffins today for first time. I found none of the negatives others have mentioned. I used fresh cranberries and did add about 1/3 cup shredded coconut which was aperfect addition to the sweet- tart contrast. A definite keeper and added to Pepperplate. Will share (recipe as well as samples) with many.